The Suzuki Jimny is a miniature 4x4 that’s rugged and reliable, but disappointing in just about every other area. Other small SUVs – like the Dacia Duster 4x4 – give you much more ability for even less cash. The Suzuki Swift is an affordable supermini that majors on fun and style, and on that score, it competes with cars like the Seat Ibiza, Hyundai i20 and Mazda 2. The Ignis looks bonkers and is fun to drive; and, for many buyers, that will be enough. The Ignis name returns to UK after a decade in the wilderness. While the old car was a bland, boxy supermini, the latest Ignis has been reinvented as a riotous looking compact urban crossover. The S-Cross’ startling nose job may well polarise opinion, but the latest range of petrol engines and affordable entry price are sure to be met with universal approval. Suzuki claims the latest S-Cross is effectively an all-new car, thanks to a cosmetic nose job, revised suspension settings and a couple of new engines. We’re interested in how it stacks up against the likes of the Nissan Qashqai and Kia Sportage. The Baleno is Suzuki's second supermini, offering buyers something larger and rather more spacious than the smaller and cheaper Swift. The Vitara normally trades blows with urban crossovers like the Renault Captur, Skoda Yeti and Nissan Juke but an ambitious price point for a new top-of-the-range model may prove a step too far. The Suzuki Celerio is a budget city car that provides lots of space and equipment for a very affordable price. 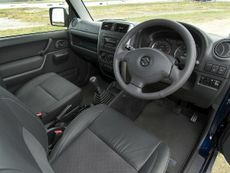 It competes with cars like the Hyundai i10 and Skoda Citigo. The Suzuki SX4 S-Cross is a small SUV to rival the likes of the Nissan Qashqai and Kia Sportage. It's good fun to drive and very affordable to buy. 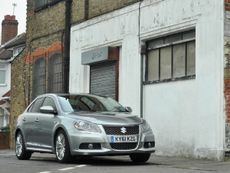 The Suzuki Kizashi is a handsome car, and this is aided by the fact we only get the fully-kitted Sport trim level here in the UK. Read the Suzuki Jimny 4x4 (1998 - ) car review by Auto Trader's motoring experts, covering price, specification, running costs, practicality, safety and how it drives.